Although I love writing about my New York adventures, I miss creating delicious things and sharing my recipes with you. To be honest, I'm currently not cooking the most exciting dishes here in New York. Partly because I'm quite lazy when I just have to cook for myself, and I make very simple meals with a couple of ingredients thrown together (usually a mix of vegetables, grains and sweet potato or pulses). So since I haven't posted a recipe in ages, I thought I'd post one which I've actually been meaning to share for ages: my vegan lasagna! Although it might not win a beauty pageant, it's actually one of my tastiest recipes, and I've made it very often for dinner parties and family dinners. 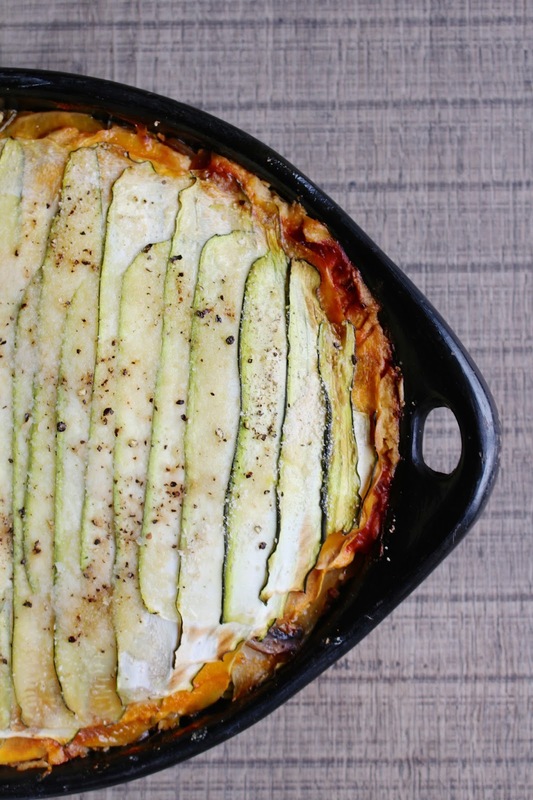 This vegan lasagna is much lighter than it's original counterpart but just as good. It's a bit of work, but the result is more than worth it! Last summer we had a real overdose of zucchinis in our vegetable garden. So I cooked with zucchinis every single day, spiralized them, sliced, barbecued, grilled, soup'd etc. One day, I really felt like eating a tasty homemade lasagna. So I decided to create my own recipe using zucchini and squash as "sheets" and make a vegan bechamel sauce. It was a process of trial and error, but after making it a couple times I think I nailed it. Okay, the list of ingredients might look a bit daunting, but if you take it step by step you can pop the lasagna in the oven in under an hour. Start by making the tomato sauce. Chop the onions and garlic finely and fry them in a bit of olive oil on medium heat until the onion starts to brown a little. Then add the can of chopped tomatoes and the tomato frito. Add salt, pepper and paprika powder and stir. Leave to simmer on a low heat and move on to step 2. Wash the zucchinis and peel the squash. Then take a sharp peeler, lay the zucchini flat and make long even strips. Turn around when you reach the middle of the zucchini and repeat. Do the same with the squash, although it's harder to make nice even 'sheets' because of the uneven shape. It doesn't really matter! Keep going until you have two piles of sheets. Keep the rest of the squash you didn't use in the fridge (or cube + freeze to make soup later). By now, the tomato sauce should be ready so take it off the heat and put aside. To make the béchamel sauce, start with chopping the shallots and garlic and frying them in a bit of olive oil and the balsamic vinegar until soft. Then take the soaked cashews and put them in a good food processor (I love the Thermomix). Add the water, shallots, mustard, nutritional yeast, turmeric and a bit of salt + pepper. Blend until you end up with a smooth, creamy sauce. Add more water if it's too thick. Slice the mushrooms and onion and fry them together in a pan with a bit of oil. Once the mushroom is browning, add the vegan mince and add the cumin seeds and any other spices you like. Fry for a couple of minutes and set aside when done. So now all the hard work is done, it's time for the fun part: assembling! Use a good oven-proof dish, preferably in a rectangular shape because it's easier to lay the sheets. I love using my mom's black pottery and I'm absolutely sure that it makes the lasagna taste even better. Start with a layer of zucchini sheets, then spread a thin layer of béchamel, a layer of tomato sauce and finish with the mushrooms/mince. Cover with a new layer of squash/zucchini sheets and repeat the steps until you run out of ingredients. I usually end up doing 4 layers. I make sure to finish off with a layer of sheets to seal the whole thing. Sometimes I add some more chopped tomatoes on top or some breadcrumbs. 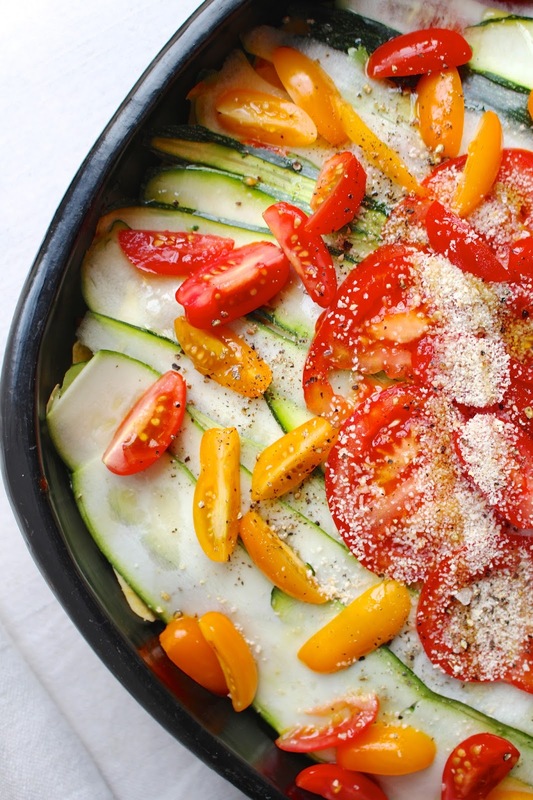 Sprinkle with some pepper, salt and a drizzle of olive oil before popping it into the oven. Put the lasagna in the oven and leave it for about an hour. I've only made this in the AGA at home, which is more gentle heat and conventional ovens, so I'd put it at 180 degrees Celsius and leave it for at least 40 mins. Check, and if it looks done then take out of the oven, you don't want to overcook it either. If the edges look a bit crispy it should be ready! Serve with a simple side salad and you're set! Although I haven't made this recipe in months (ever since zucchini season ended), I still remember all the ingredients and steps by heart. Writing this post reminded me how much I love this recipe! Although it's completely vegan, it has a rich flavor like 'real' lasagna thanks to the mushrooms (that umami flavor can't be beaten), creamy cashew sauce and onions. The squash adds a subtle sweetness which I love! Because you're not using pasta sheets, meat, and real béchamel sauce, it's much lighter than actual lasagna, but still just as comforting. I love this recipe and I hope you will too!